And so we come to the last entry in our special series on Lost London looking at some of London’s gates – this time the only gate located on the south side of the Thames. Located at the south end of London Bridge, this gate guarded the bridge entry in medieval times. When the first gate was built here remains something of a mystery but it is known that the first stone bridge, built in the late 1100s under the direction of priest Peter de Colechurch (it opened in 1209), certainly included a gatehouse known as the Stone Gateway (referred to by some as Bridge Gate) at the southern end. The practice of parboiling the heads of traitors and the dipping them in tar before putting them on pikes above the gate apparently dates from 1305 when Scottish rebel William Wallace’s head was displayed there. The practice apparently continued until 1678 when goldsmith William Stayley’s head was the last to be displayed there. As we mentioned in our earlier post on London Bridge, famous heads to adorn the gateway over the years included Peasant’s Revolt leader Wat Tyler in 1381, rebel Jack Cade in 1450, the former chancellor Sir Thomas More and Bishop John Fisher in 1535, Thomas Cromwell in 1540 and Guy Fawkes in 1606. 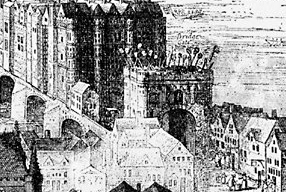 Pictured above is an enlarged detail of a 1616 print showing London Bridge by Claes Van Visscher – the heads are clearly visible on top. One German visitor famously counted 30 heads on top when he visited in 1598. The gate (and it should be mentioned there was also another gate on the bridge with a drawbridge which was replaced by Nonsuch House in 1577) was presumably removed sometime after 1756 when an Act of Parliament authorised the removal of shops and houses on the bridge.